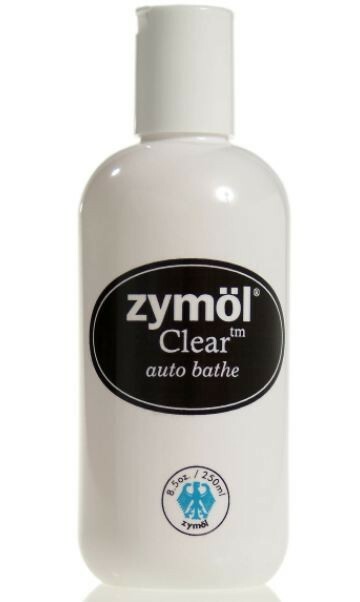 Zymol Clear Auto Bathe contains a unique combination of pure tallow, pure coconut essence oil conditioners and lemon extracts to gently clean and care for your car. Zymol Auto Bathe not only leaves behind an ultra-thin coat of gloss resulting in a beautiful shine, but also gives off a delightful scent. You'll never settle for the neighborhood car wash again! An extravagant wash for pampering your vehicle! Zymol introduces a luxury Auto Bathe to delight even the most discriminating auto-enthusiast. Zymol Clear Auto Bathe is a non-sodium, non-phosphorous car wash containing surface conditioners and protective oils that release and remove grime yet won't strip off the wax. Zymol Clear Auto Bathe is natural and gentle yet very effective, making the most of cutting-edge research and development in non-toxic cleansers. Though tough against paint-damaging agents, Auto Bathe is amazingly surface-friendly. Zymol offers you two complete Automotive Enhancement Systems. The Zymol Hand-Crafted� and Zymol SUV Premium� systems, each containing natural washing, cleaning and feeding products. All Zymol paste waxes are handcrafted from a carriage maker's formula developed in the German town of Bischofsheim in the late 1800s. Though the original formula was based on animal products, it has been updated through research and engineering to be an entirely plant-based product today. Zymol uses nutritive oils to replace the oils originally found in your car's finish without the use of harsh chemicals or abrasives. Zymol products are safe for all paint finishes, including new clear-coats, acrylics, urethanes and classic lacquers. Zymol Hand-Crafted� waxes have a Carnauba content of 37 to 61% by volume, five to ten times the Industry Standard. The Carnauba used is Brazilian No. 1 Yellow and rare No. 1 White Carnauba, the very highest grade available. This gives both greater protection and increased depth of shine compared with run-of-the-mill car care products. Zymol waxes are an enzyme mixture until they are applied to your car. With air as a catalyst, Zymol becomes "wax" and starts bonding to your car's surface. Zymol wax is very easy to apply and remove and will not leave any white residue or buildup along seams or in crevices. The above information has been provided by the Manufacturer and Garage Envy cannot guarantee the accuracy thereof or endorse the opinions expressed.